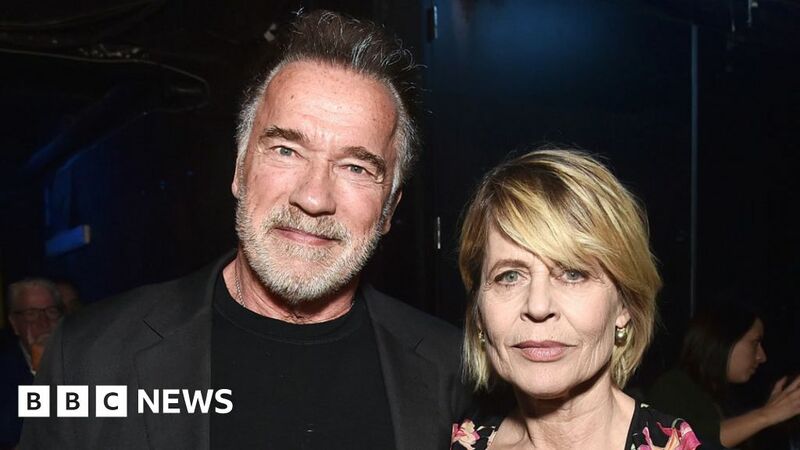 Thirty-five years on from the original Terminator, Arnold Schwarzenegger has finally caught up with Sarah Connor – better known as actress Linda Hamilton. The pair were reunited on the last day of the CinemaCon event in Las Vegas, where footage from the latest film in the Terminator series was unveiled. Schwarzenegger, now 71, said he was “so excited” to be reunited with Hamilton and director-producer James Cameron. “The whole team is back together,” he told an audience of cinema owners. In the original Terminator film, Schwarzenegger played a killer robot sent from the future to kill Hamilton’s character. The pair returned for 1991 sequel Terminator 2: Judgment Day and will be seen again in Terminator: Dark Fate, due out in October. The new film picks up the action where Terminator 2 left off, ignoring the other sequels and reboots made between 2003 and 2015. Deadpool’s Tim Miller is directing the film, with Cameron – director of the first two instalments – on board as a producer. Thursday’s presentations also included footage from Gemini Man, the latest science-fiction opus from director Ang Lee. The film sees Will Smith squaring off against a younger version of himself – a technical challenge that Lee said had necessitated “a leap of faith”. “I had it up to here with so much Will Smith,” joked the Oscar-winning director of Brokeback Mountain and Life of Pi. Other stars in Las Vegas on Thursday included actresses Jamie Lee Curtis and Octavia Spencer, who were among the honourees at the event’s valedictory awards ceremony. Held annually in Las Vegas, the CinemaCon event is an opportunity for film studios to promote their wares before an international audience of cinema owners and managers. Earlier this week, Dame Helen Mirren played to the gallery by rounding on streaming giant Netflix, viewed by many as a threat to cinema attendances and theatrical exhibition.